The freight consisted of four fuel tanks each measuring 12 feet wide and weighing 50,000 pounds and a 55,000-pound control module over 12 feet wide that required two pilot cars. Once loaded on trailers, the pieces measured more than 17 feet high. The remaining seven loads of steel, pipe and lumber turned into 13 loads making a grand total of 18 loads over the road. 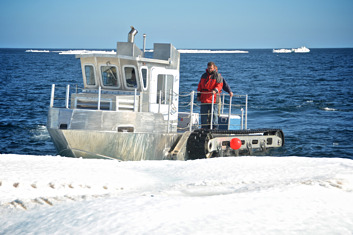 “This presented an issue because we were using a shallow draft tug and barge at Prudhoe Bay that didn’t have the capacity,” explains Seth Perry, Lynden Transport Project Manager. 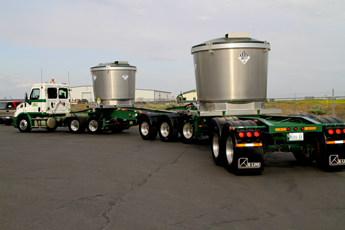 The Lynden team set to work to consolidate the loads at Fairbanks and Prudhoe Bay and reduced them to 12 loads on wheels, two 20-foot deck positions and two vehicles that could be stowed out of the way in the corners. 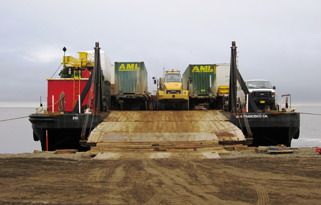 “Without the hard work of our employees in Fairbanks and Prudhoe Bay, we could not have fit all the freight on the barge and the customer would have to build a road to transport the remaining loads or fly them in.” Lynden’s Tundra Bear tractor was put in service at Prudhoe Bay to load the chartered barge for the two-day trip to the construction site at Wainwright. 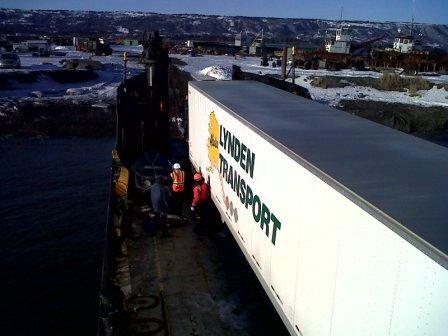 It also rode the barge to offload the freight directly onto the beach since Wainwright has no dock. 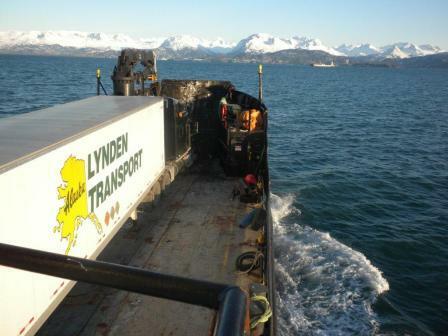 Lynden Transport employees flew to the coastal village to meet the barge and coordinate the offload. "We had a few weather issues", Seth explains. "Using a light draft combo you don't have much vessel in the water so the slightest gust can really toss you around. Also when stowing the barge we had to get the trim and stability right to get over an ice shelf. 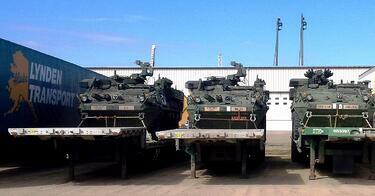 But all loads were delivered on time and without damage, which is pretty amazing considering the journey."